We’re excited to announce a new collaboration! A partnership of the Kansas City Area Transportation Authority (RideKC) and BikeWalkKC’s RideKC Bike bike share program, the Bike + Bus Pass allows users to access both bike share and bus from a single pass card. Users who maintain a 31-day bus pass for $50/month can upgrade their membership to the Bike + Bus Pass for no additional cost, adding unlimited 60-minute bike share trips to their transit options. Users who have a Bike + Bus Pass can access unlimited bike and bus trips all month long. Bike trips are limited to 60-minutes per trip, with $2 per 30 minutes for overage time. To check out a bike from any of the 42 station locations, use the Bike + Bus pass card by tapping it on the sensor on top of the dock of the bike you want to check out. Bikes can be both checked out and returned to any station location. 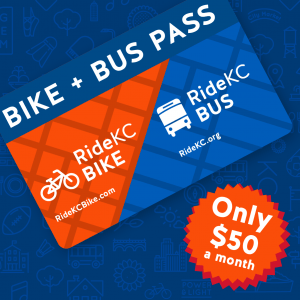 Sign up for your Bike + Bus Pass on the RideKC Bike website. Once at the website, click the Join Now button and select the option to “Join as a Bike + Bus Pass user.” Users who already have a monthly bus pass and want to upgrade to the Bike + Bus Pass must re-sign up through the website once their current month pass expires with RideKC.